BRICK STAR: I Just Won This DUPLO Thomas the Train Lot on eBay!!! I Just Won This DUPLO Thomas the Train Lot on eBay!!! I just won this on on eBay! 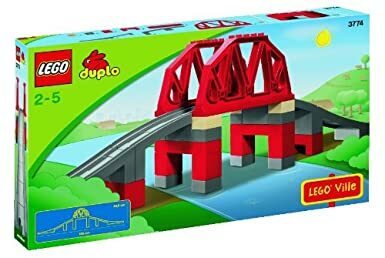 I've always wanted to do a the DUPLO train set for my son, and was looking at the LEGO Duplo Legoville Deluxe Train Set (5609) but it was sooo expensive! We actually bought the LEGO DUPLO Number Train 10558 but I was waiting for a good deal on some track, because it doesn't come with any. My son was not impressed. Now I just need a large coffee table or something to put a train layout on. I just think the toddlers enjoy trains much better when they can walk around a table and play... at least that is what I have seen at our friend's house, who has the Imaginarium City Central Train Table with the wooden train set. Thomas the Train Lego Duplo sets. I think there are 5 to 7 different sets. It great condition. I paid $103 with shipping and I'm really hoping it is worth my money and not too beat up or incomplete. In my experience, that is a pretty good sized tub, so I'm really looking forward to getting into it and setting up a train layout for our little guy!! !